Product categories of Full Carbon Fiber Tube, we are specialized manufacturers from China, Full Carbon Fiber Tubes, Carbon Fiber Tube suppliers/factory, wholesale high-quality products of Full Carbon Fiber Wing Tube R & D and manufacturing, we have the perfect after-sales service and technical support. Look forward to your cooperation! Full Carbon Fiber Tubes are very light and strong. They are widely used in Aviation, Drone, DIY etc. Our popular tubes are wrapped carbon fiber round tubes and octagonal tubes. Drilling holes, slotting and Logo Printing can be provided. For assembly,we offer aluminum clampes. They are made of 6061-T6 aluminum material.If you need other materials, they are available as well. 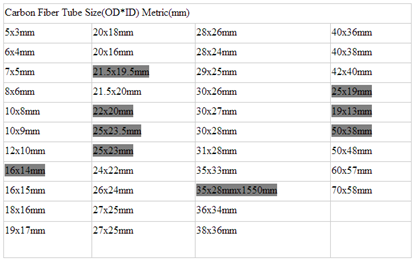 We have various sizes, please check the below chart.